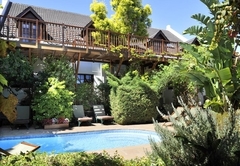 Gable Manor is one of the Franschhoek guest houses and provides accommodation in 7 guest rooms for tourists visiting the Cape Winelands region. 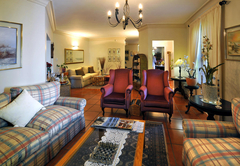 Exceptional value combined with elegance, relaxed comfort and genuine hospitality. 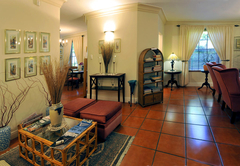 Gable Manor is proud to have hosted 67 nationalities in 6 years. 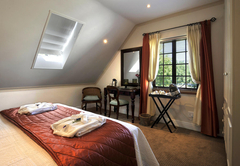 To enhance your experience the rooms and public areas inside are all non smoking and we take over 12 year olds only. 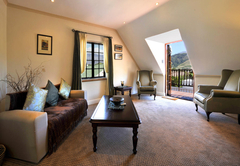 Gable Manor is located in the extraordinarily beautiful village of Franschhoek in the Cape Winelands. 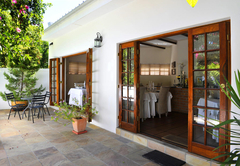 Affectionately known as the ‘Gourmet Capital of South Africa’, Franschhoek is home to many of South Africa’s most celebrated chefs - a fitting tribute to the valley’s French Huguenot origins. Embraced by majestic mountains, the surrounding vineyards supply some of the country’s finest wines. The charming main street bustles with quaint shops, exciting galleries, street cafés and restaurants. 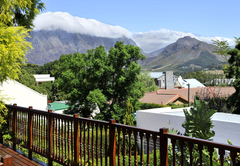 Just 70 km from Cape Town, Franschhoek is an ideal and less-hurried base from which to explore the Mother City, the seasonal whale watching and Route 62 (the longest wine route in the world). 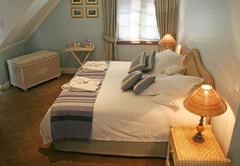 Gable Manor offers superb guest accommodation that perfectly combines comfort, elegance and tranquility. 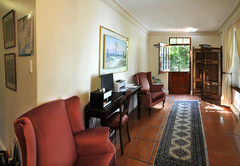 It is within easy walking distance of the village. 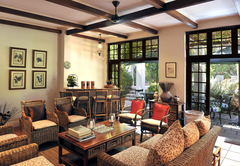 Guests are welcomed into the relaxed reception/lounge area complete with complimentary sherry and port, generous seating, complimentary internet facilities and extensive reading material. There is also a warm fire for cozy winter’s evenings. 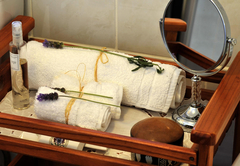 There are six rooms in total, four individually decorated bedrooms with king size or twin beds and two elegant suites with extra length king size beds and private lounges which fulfill all the needs of the discerning traveler. 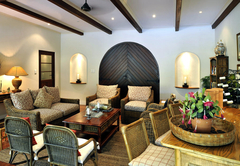 The décor is muted and the atmosphere is one of understated elegance with clever touches of thoughtful luxury. The sheltered central pool courtyard features a sparkling pool, sun loungers, umbrella-shaded tables and chairs and a generous supply of fresh towels. Adjoining the courtyard, the pool-lounge provides instant shade and comfortable cane furniture, a collection of games and shower facilities (ideal for early arrivals and late departures). 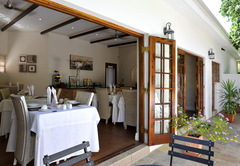 Breakfasts are served overlooking the pool courtyard with the majestic Franschhoek Mountains beyond. This elegant venue with its crisp white table linen, generous chairs and original artworks is world-famous for its decadent breakfasts. Concertina doors open up to the outdoors in summer, whilst winter days are gently warmed by a gas fireplace. 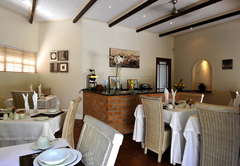 Breakfasts are sumptuous, buffet-style followed by an optional cooked breakfast made to order with special emphasis on the use of fresh herbs from the garden. 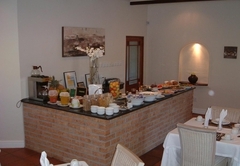 Typical fare includes freshly baked croissants/muffins and local breads, seasonal fresh and stewed fruits, cereals and yoghurts, home made jams and preserves, platters of cheeses and charcuterie/salmon trout, home-prepared ham, cooked breakfast with eggs prepared any way you like, a selection of specialty teas and special Blue Mountain coffee. 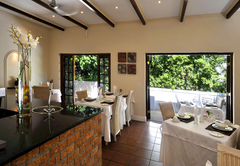 Your hosts, Marlyn and Don are renowned for their friendly assistance and recommendations - they will gladly make your restaurant and wine tasting reservations and advise on locally available activities to suit all tastes. 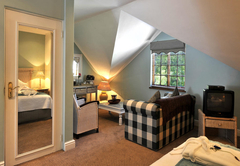 Whether your stay is for 2 nights or a week, you are bound to leave inspired! 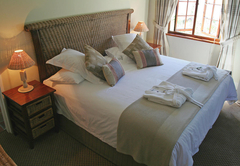 King size bed / can be configured as twin beds. 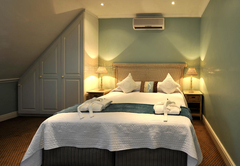 Air conditioning, DSTV, tea/coffee tray, hair drier, UK plug and full en-suite bathroom with heated towel rail. NO SMOKING, no children under 12 and no pets. 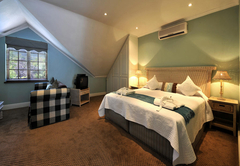 All air conditioning, DSTV, tea/coffee tray, hair drier, UK plug and full en-suite bathroom with heated towel rail NO SMOKING, no children under 12 and no pets. 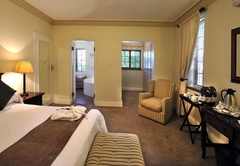 the + is; room 2 a junior suite, 5 a lounge area, both extra length king beds and 4 has a balcony. 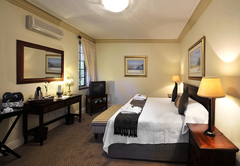 The bedroom has an extra length king size bed & the lounge has a sleeper couch. 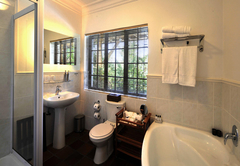 Air conditioning, DSTV, tea/coffee tray, hair drier & full en-suite bathroom. A balcony with great views. An ideal Honeymoon room. NO SMOKING, no children <12 & no pets. Response timeGable Manor typically responds to requests in 5-10 minutes.